On the occasion of the forthcoming 50th anniversary of the establishment of the Tibet Autonomous Region, the People’s Republic of China has released a white paper entitled “Successful Practice of Regional Ethnic Autonomy in Tibet”. 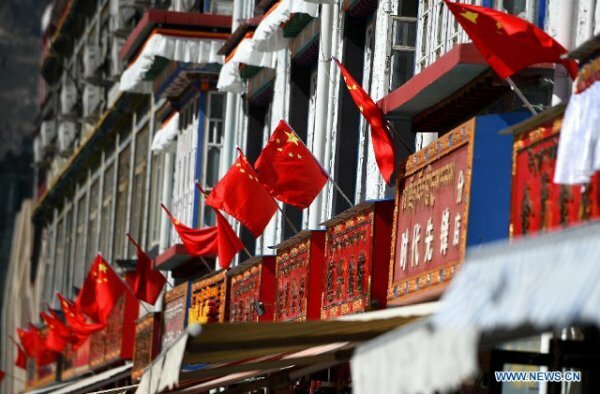 The white paper applauds the so-called “great changes”, which have taken place in the region since 1965 and praises the questionable “full rights to freedom of religion” of the Tibetan people. China issued a white paper today commemorating the upcoming 50-year anniversary of the founding of the Tibet Autonomous Region going into exhaustive detail about how totally awesome everything is going there, so awesome in fact that they now say Tibet is in its "golden age." Tibet came under PRC rule in 1951, but it wasn't until September 9th, 1965 that the Tibet Autonomous Region was formally established (with a few bumps in between). The white paper titled "Successful Practice of Regional Ethnic Autonomy in Tibet" issued by the Information Office of the State Council explains how really terrible Tibet was before it came under PRC control and how since "Tibet has established the new socialist system and achieved historic leaps and bounds in its economic and social development." Here's the whole thing if you'd like some light Sunday reading. Like any great piece of inspirational writing, the paper starts with great despair and tragedy that must be overcome in a section simply titled "Old Tibet: Dark and Backward." Just a half-century later, the paper compares that pitiful situation to the here and now: "Although it has been only 50 years since the founding of Tibet Autonomous Region, great changes have taken place. Tibet is now in its golden age." The paper then discusses social and religious changes trumpeting that Tibetan citizens enjoy full rights to freedom of religion and backing that up by listing how much money the state has allocated to rebuild monasteries. They also touch upon one of the formally atheist state's favorite subjects—Reincarnation. We'll see what the Dalai Lama has to say when he finds out that Tibetan civilization has reached its pinnacle without him there. We know Richard Gere is going to be disappointed. Of course, there are no periods of Anarchy during a Golden Age, so that and the increased Production should work out well for the PRC.